The HTC One Mini 2 was announced in May 2014. 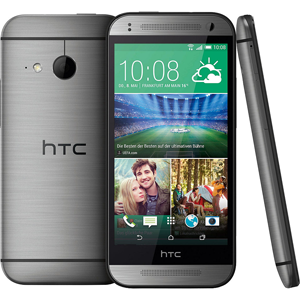 It is a mid-range variant of the 2014 flagship device, the HTC One (M8). It has a 4.5" Super LCD2 720p display, 1.2GHz quad-core Snapdragon 400 processor, 1GB of RAM and 16GB internal storage. Unlike it's flagship counterpart, the Mini 2 has a large 13MP camera. The Mini 2 is powered by a 2110 mAh battery. And as with all HTC devices, it runs Sense, HTC's launcher interface running on top of Android.